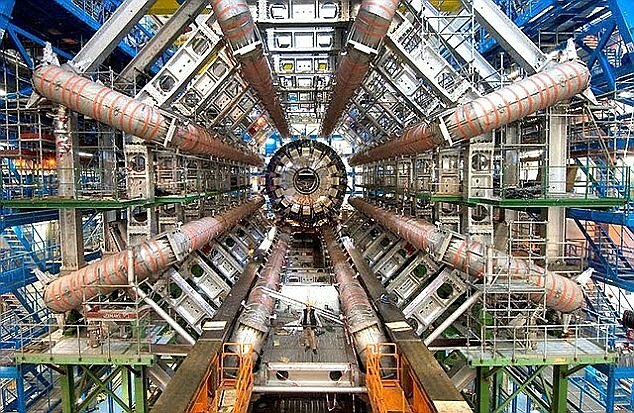 It has found the 'God particle', and could soon reveal a mysterious force known as 'dark matter'. But when it turns on next week, some scientists are betting the Large Hadron Collider will detect something just as exciting; a parallel universe. This is according to a new study that claims miniature black holes - a key sign of a 'multiverse' - could be detected in Cern's LHC in Geneva. The Rainbow Gravity theory suggests that gravity's effect on the cosmos causes different wavelengths of light to behave differently. This means that particles with different energies will move in space-times and gravitational fields differently. The theory was proposed 10 years ago in an attempt to reconcile difference between the theories of general relativity and quantum mechanics. One consequence of rainbow gravity is that our universe stretches back into time infinitely with no singular point where it started. 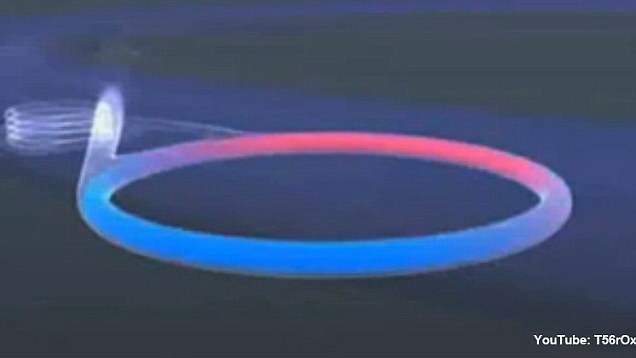 'Just as many parallel sheets of paper, which are two dimensional objects (breath and length) can exist in a third dimension (height), parallel universes can also exist in higher dimensions' Mir Faizal from the University of Waterloo told Dailymail.com. Professor Faizal and his team have calculated the energy at which they expect to detect these mini black holes in gravity's rainbow, according to a report by Lisa Zyga at Phys.org. 'If we do detect mini black holes at this energy, then we will know that both gravity's rainbow and extra dimensions are correct,' added Professor Faizal. When it's activated, the energy with which the LHC smashes particles together will be twice what it was during the time when it made the discovery of the Higgs boson. Billions of particles flying off from each LHC collision are tracked at Cern detectors to establish when and how they come together and what shapes they take. The Cern theoreticians say this could give clear signs of dimensions beyond length, breadth, depth and time. At such high energy gravity many be even tracked disappearing into them. Parallel universes can exist within these dimensions, the thinking goes, but only gravity can leave our universe into these extra dimensions. If extra dimensions do exist, the study suggests that they would lower the energy required to produce black holes which the LHC could pick. Professor Faizal suggests the reason these black holes have yet to be detected is because our current model of gravity gets modified at very high energies. According to Phys.org, in the latest study, the new theory of gravity's rainbow has been used to account for why the LHC has not yet found tiny black holes. Einstein's theory of relativity states that gravity is caused by space and time curving. 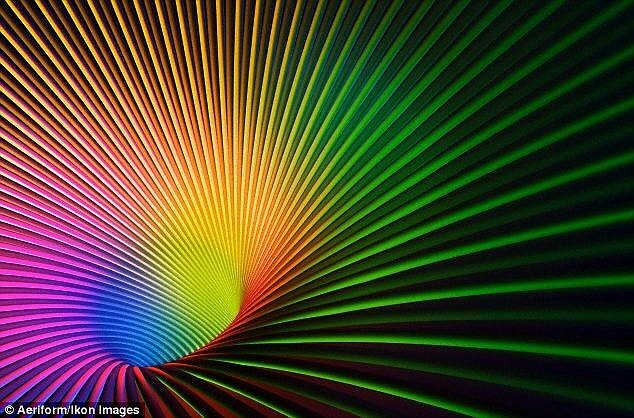 Gravity's rainbow says that space and time curve differently for particles of different energy. So, gravity's rainbow suggests that gravity's effect on the cosmos causes different wavelengths of light to behave differently. Using gravity's rainbow, the scientists found that more energy is required to detect mini black holes at the LHC than previously thought. But the latest study says this is too low. Instead, the model predicts that black holes may form at energy levels of at least 9.5 TeV in six dimensions and 11.9 TeV in 10 dimensions. 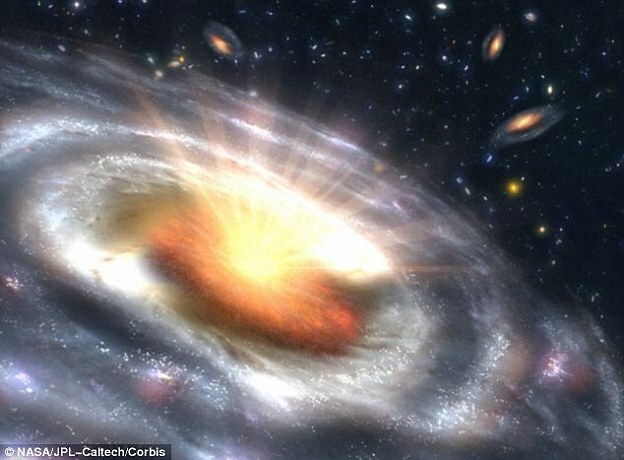 If mini black holes are detected at the LHC at the predicted energies, not only will it prove the existence of extra dimensions and by extension parallel universes, said Ahmed Farag Ali from Florida State University. The universe is a hologram and everything you can see - including this article and the device you are reading it on - is a mere projection. These strings are holograms of events that take place in a simpler, flatter cosmos. Professor Maldacena's model suggests that the universe exists in nine dimensions of space, and one of time. The holographic principle suggests that, like the security chip on a credit card for example, there is a two-dimensional surface that contains all the information needed to describe a three-dimensional object - which in this case is our universe. In essence, the principle claims that data containing a description of a volume of space - such as a human or a comet - could be hidden in a region of this flattened, 'real' version of the universe. In a black hole, for instance, all the objects that ever fall into it would be entirely contained in surface fluctuations. This means that the objects would be stored almost as 'memory' or fragment of data rather than a physical object in existence.